Siegfried Janzen: Mennonite Central Committee (MCC) Director of post-World War II Refugee Camp at Gronau, lay minister, pastor and prison chaplain; born 16 September 1920 and died 2 August 2005. For years Siegfried was best known for his MCC service in Europe. The picture with his wife Margaret (Wiebe), of Vineland, is from that time. Then followed years of making a living for his family in the Annapolis Valley of Nova Scotia. In retirement he served as pastor of Petitcodiac Mennonite Church in New Brunswick, 1985 to 1995. While there, he became involved in chaplaincy service at the Dorchester Penitentiary. His service there was recognized in 2004 with the prestigious Taylor Award presented by Corrections Canada for outstanding volunteer work in chaplaincy and restorative justice. Siegfried was the second son of Jakob K. Janzen, the house father of the Bethania Mental Hospital (Alt-Kronsweide, ChortitzMennonite Settlement) from 1912 to 1920. The family moved to Orloff, Zagradowka, Kherson Province, Ukraine and lived there from 1920 to 1924. This is where Siegfried was born on 16 September 1920, to Martha, Jakob's first wife. She was the mother of three sons: Jacob, Siegfried, and Walter. Other members of the family, John, Martha, Waldemar, and Edmund, were born to Katharine Quiring Janzen, the second wife. The Janzen family immigrated to Canada in 1927 where they settled on a farm at Laird, Saskatchewan. In 1940-41 the family chose Ontario over British Columbia and settled on a fruit farm, near Grimsby, between Hamilton and St. Catharines, and joined the Vineland Mennonite Brethren Church where Jakob Janzen served as one of the ordained ministers. Siegfried's formal education was somewhat limited. He finished grade school in the Laird area, took some high school subjects by correspondence in Saskatchewan, as well as in night school in Hamilton, but never finished high school. After his work in Europe he went to Tabor College as a "special student," but never completed a BA degree. In 1942 Siegfried was drafted and served as a conscientious objector at Chalk River. After working there eighteen months, he was transferred to farm labour at Chatham, Ontario, his wages shared by the Red Cross. Arrangements were then made through an Ontario member of the legislative assembly for Siegfried to serve out his alternative service on the farm of Arthur Ecker of Campden, near Vineland. In Vineland Siegfried met Margaret Wiebe and they married in 1945. They had four daughters: Carol Anne, Madeline, Helen and Wilma. After his alternative service, Siegfried volunteered for Mennonite Central Committee service. 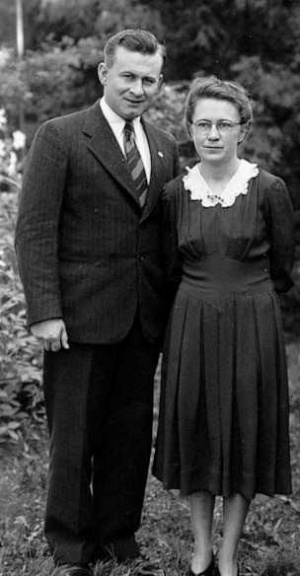 Siegfried and Margaret were sent to Europe, where they worked with the General Relief section in Holland at first, distributing food and clothing to refugees. They were switched to the Mennonite Aid section in 1947 where they helped to develop a camp at Gronau on the Holland/German border. Over a period of three years he directed the processing of refugees fleeing from the repatriation implications of the Yalta Accord that Stalin had demanded from Roosevelt and Churchill. Following the devastation of war the refugees hoped to be admitted to Canada. This meant serving under the supervision of C .F. Klassen, European Commissioner for Refugee Aid and Resettlement under the Mennonite Central Committee in Europe. Siegfried's contribution was left somewhat submerged in the more dramatic aspects of the rescue and resettlement of Russian Mennonites' experience by Peter and Elfrieda (Klassen) Dyck. Nevertheless, Siegfried directed the processing of more than 10,000 such refugees at Gronau, a difficult task for anyone. Siegfried returned to Canada in 1950, went to Tabor College to complete his education and was expecting another assignment with MCC. But because controversies arising from that overseas assignment dogged his life for some years, he and his family retreated from Ontario to the Kentville area of Nova Scotia. He had meanwhile acquired a skilled trade, that of brick-layer and eventually fireplace builder under the company name of Valley Masonry. In Nova Scotia his daugthers had access to excellent schools, including Acadia University, and he made many significant contributions to Kentville Baptist Church during a period of more than two decades. He taught Sunday School, wrote and directed numerous pageants for special seasons in church life, was fully involved in the Valley United Baptist Association, and one year participated in the Canadian Baptist Overseas Mission Board. In the Maritimes, Siegfried realized some of the opportunities for service in the church that were denied him in Ontario. Not only was his service to the United Baptists of the Atlantic Provinces much appreciated, he was invited at age 65 to take up pastoral duties at the Petitcodiac Mennonite Church, the only member church in the Maritimes of Mennonite Church Eastern Canada. The Petitcodiac church recognized the lay ordination given to Siegfried by Kentville Baptist Church. At the same time he began to serve in prison visitation, conflict resolution, and mediation at Dorchester Penitentiary and Westmorland Institution. He was a member of the Citizens' Advisory Committee for the Westmorland Institution, and a member of the board of Opal, a home for mentally challenged adults, founded by Petitcodiac Mennonite church. He was also instrumental in the development of a Peace Centre for the Greater Moncton Area. For all this activity and his total commitment to restorative justice to which Siegfried and Margaret became personally involved, Siegfried Janzen was honoured with the 2004 Taylor Award by the Correctional Service of Canada (CSC) and the National Volunteer Association. This award is presented to individuals who have devoted considerable time and energy to working within Canada's corrections system. Siegfried was considered qualified because of his 23 years of service given to restorative justice initiatives and to prison ministry. Siegfried Janzen died 2 August 2005 in a Moncton, New Brunswick hospital of complications from gall bladder surgery, not having reached his 85th birthday. This was four days before a planned celebration of 60 years of marriage to Margaret Wiebe Janzen. The family was gathering for this celebration to be held in Moncton, but instead, the scene shifted to the Baptist Church of Petitcodiac for the funeral to celebrate Siegfried's life of commitment to God's service and his beloved family. Dyck, Peter and Elfrieda. Up From the Rubble: the epic rescue of thousands of war-ravaged Mennonite refugees. Scottdale, PA: Herald Press, 1991. Epp, Frank H. Mennonite Exodus: The Rescue and Resettlement of Russian Mennonites since the Communist Revolution. Altona, MB: Published for Canadian Mennonite Relief and Immigration Council by D. W. Friesen, 1962. Janzen, Margaret Wiebe. Telephone conversation with author, 3 August 2005. Penner, Peter. "Siegfried Janzen and Mennonite Migrations." Mennonite Reporter (8 July 1974): 9. Penner, Peter. "Mennonites in the Atlantic Provinces." Mennonite Life 31, No. 4 (December 1976): 16-20. Penner, Peter. File of collected materials on Siegfried Janzen and Daybook entries. Penner, Peter. "Janzen, Siegfried (1920-2005)." Global Anabaptist Mennonite Encyclopedia Online. 2006. Web. 23 Apr 2019. http://gameo.org/index.php?title=Janzen,_Siegfried_(1920-2005)&oldid=147018. Penner, Peter. (2006). Janzen, Siegfried (1920-2005). Global Anabaptist Mennonite Encyclopedia Online. Retrieved 23 April 2019, from http://gameo.org/index.php?title=Janzen,_Siegfried_(1920-2005)&oldid=147018. This page was last modified on 23 January 2017, at 14:32.